The society's July 2016 Newsletter is now available. 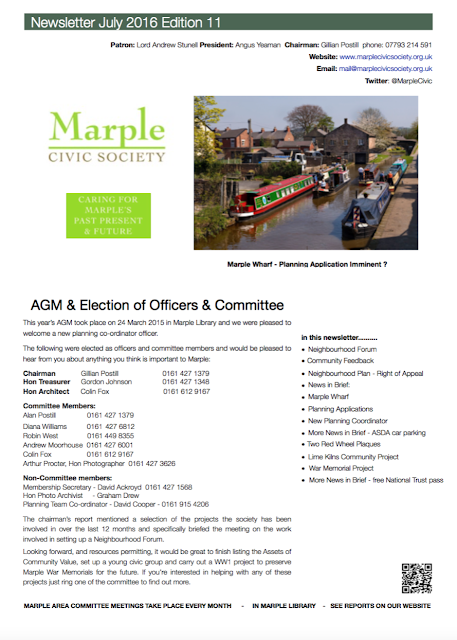 The society's next speaker meeting will take place from 4.00pm - 5.00pm tomorrow, Tuesday 26th July 2016 in Marple Library - there is a lift available. The meeting included an Open Forum discussion on the subject of "Schools and School Organisation in Marple". Marple Area Committee Open Forum "School Organisation"
The next Marple Area Committee meeting will take place on 13th July at 6-00pm in Marple Senior Citizens Hall. The meeting will commence with an "Open Forum" debate on the subject of "School Organisation". The SMBC Head of School Organisation, Stephen Bell, will attend to answer questions. Councillors will be available for informal discussion from 5-30pm.